The St. Lawrence Market stands where the very beginnings of Toronto were established in 1793, in what is today referred to as the â€œOld Town of Yorkâ€ (corner Front and Jarvis Sts.) The original city market stood one block north (King and Jarvis Sts. ), in a structure that also held the city council chambers. However, a fire in 1849 destroyed most of the neighbourhood. The current market comprises two buildings, one either side of Front St. The south market building dates from 1905, an imposing red brick structure incorporating what remains of the original City Hall. One merely has to stand in front of the main market entrance to see how one building has wrapped itself around the other. In the 1970â€™s, the former council chambers on the second floor were transformed into a civic art gallery, which presents an on-going photographic exhibit on the development of Toronto. St. Lawrence Marketâ€™s north building is open on Saturdays only, and features fruits and vegetables and other agricultural products, often sold by the same farmers who produce them. The south building houses dozens of permanent vendors over two floors, and operates Tuesdays through Saturdays. The St. Lawrence experience is perhaps a more genteel one than in Kensington Market (itâ€™s been called Torontoâ€™s â€œyuppieâ€ market), but the quality, selection, and prices are nonetheless very good. The best day to visit is Saturday. 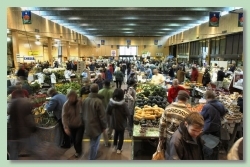 Farmers arrive prior to the 5:00 a.m. opening time to set up their kiosks, and by 7:00 the place is humming. There are outdoor kiosks as well, even in winter, and the market takes on a special atmosphere prior to major holidays, when vendors are selling Christmas trees, wreaths, or whatever is seasonally appropriate. The true Torontonian will enjoy breakfast at the market – be sure to visit the Carousel Bakery for a Canadian Peameal Bacon sandwich. Peameal bacon is a Canadian favourite – salt- and sugar-cured extra lean ham, rolled in cornmeal. Itâ€™s a signature snack of Toronto, and well worth trying out.